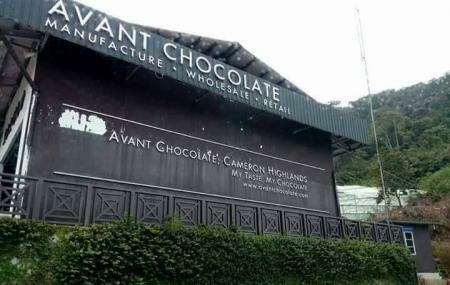 Find hotel near Avant Chocolate Cameron H ..
Avant Chocolate Cameron Highlands is a small shopping mall where you will get plenty of chocolate items along with a special playing area for the kids. Lavender ice-cream is the most favoured item here among the visitors. It is a place where you will the small animal area for the kids beside a beautiful cafe. The staff at Avant Chocolate Cameron Highlands deliver the best service in terms of manufacturing the chocolates with natural ingredients. There are plenty of dishes in the dessert section which you cannot miss especially the strawberry jam. How popular is Avant Chocolate Cameron Higlands? People normally club together Agro Technology Park In Mardi Caameron and Gunung Brinchang while planning their visit to Avant Chocolate Cameron Higlands. People also prefer to start their day with Avant Chocolate Cameron Higlands. Love this place which is suitable for the whole family. Great place for kiddies and photo taking. Love the colourful huts is one of the main features here. Of course, the special lavender ice cream and other special chocolates should not be missed. Beautiful location and lovely place in Cameron Highlands. Go for the homemade lavender ice cream or strawberries ice cream it's delicious. Nice display and there's cafe here for visitors to have their meals or coffee. There is she stalls selling fruits as fresh vegetables. They added a place for kids to row a boat in a pool. Lovely place for family. One thing? Sweets! Place: easy parking Activity: feed rabbits etc, dine in, chocolates, photoshoot Fee entrance: free Fee for feeding animals: RM10 Menu: desserts- cakes, puff, ice cream, Western etc. Speciality: ice cream popsicle I think this place should be in your list, this place is cute, a lot of people comment about flies, I didn't find even one. The flowers are a bit wilt maybe someone pick them or whatever. They are a lot to shop here aside chocolates such as lavender soap.